Comments: In 1747, Hugh Morris patented 400 acres of land on the branches of Totier Creek near Warren in Albemarle County, Virginia and built his home there. This property is one of only a few properties in Albemarle County that has remained in the same family since the original land grant was issued by King George II and witnessed by Sir William Gooch, Colonial Governor of Virginia. The property has been farmed continuously for 7 generations of the Morris family. The house was not all built at one time but instead evolved room-by-room from a large room at what is today the house's center. 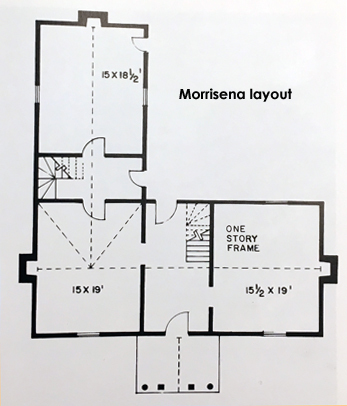 According to K. Edward Lay's assessment in The Architecture of Jefferson Country: Charlottesville and Albemarle Co., VA, the eastern single-cell portion of Morrisena (see drawing at right) appears to be older than the western part, which contains a center passage and another room that probably date to the early nineteenth century. An ell to the north was added even later. In 2005, John Lacy Morris, Jr., was the seventh generation of the Morris family to reside on the property. Surviving outbuildings included a kitchen and a smokehouse. 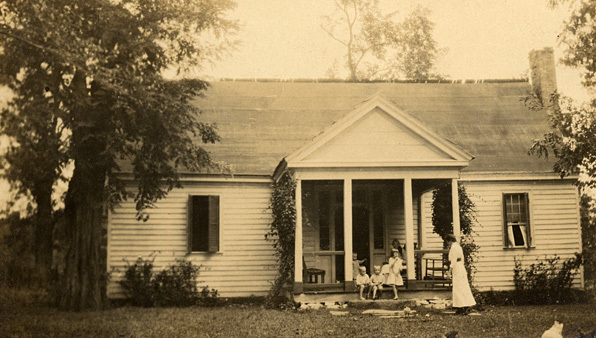 In the 1917 photo above, Lelia Lacy Morris (1854-1919) sat in the porch chair at right with four of her grandchildren sitting or standing on the porch in front of her, namely (L to R): Frances Morris (1881-), John Lacy Morris, Jr. (1909-2005), George William Morris (1911-1984), and Virginia Magness. The lady standing in front of the porch looking at the happy kids is Virginia Morris Magness (1884-), daughter of Lelia Lacy Morris and mother of Virginia Magness. 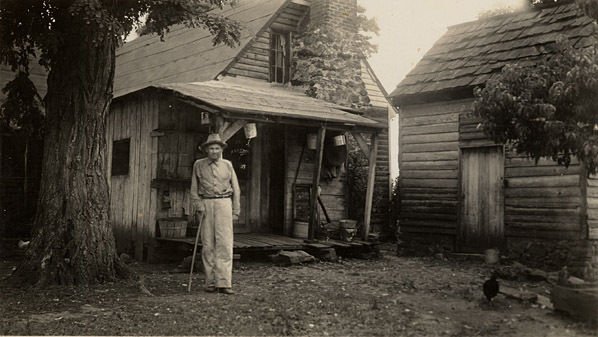 Shown below are two photos taken circa 1970 of John Lacy Morris, Jr., standing at the back his lifelong Morrisena home. 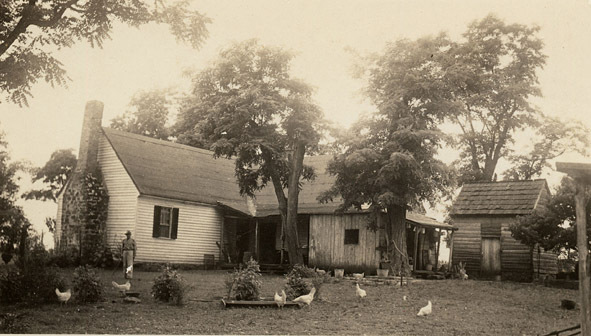 Two porches can be seen on the back of the house, one near the kitchen outbuilding and one at the center of the back of the house. This kitchen contained a fireplace so huge that a man could stand up in it. Cooked meals were run up onto the porch, around the side of the house and brought in through a door at the back center of the house. This series of porches "kept the rain off" while they were transporting food into the main house. This old kitchen fell into disrepair during John's lifetime, and it became occupied by pigeons. Additionally, the whole western side of this outbuilding dropped apart. A second kitchen outbuilding was built near his well, and eventually John would eat his meals in this new kitchen. Crops at Morrisena included wheat, corn, rye, oats, and a few potatoes. John said his father would take the grains to a grinder, who would make it into flour. John said wheat was used to make a graham flour. Ice for refrigeration was cut from a nearby pond and hauled to an outbuilding that served as the home's ice house. This ice house no longer existed in 2005. John Lacy Morris, Jr., passed away on 25 September 2005, in Charlottesville, VA. Since 2005, no one has lived in the Morrisena house, and it stands basically as it was originally built and may be the oldest house in the Albemarle Historic District. It is the only such property that retains the original house. In the 2010 edition of Preservation Virginia, Morrisena was listed as one of the most endangered historic sites in It was noted that stabilization is needed to insure the house will remain standing. Additionally the site is threatened by lack of home occupation and is vulnerable to theft and vandalism. Second Image: The drawing of Morrisena at above right was drawn by K. Edward Lay and appears in his book, The Architecture of Jefferson Country: Charlottesville and Albemarle County, Virginia, (University Press of Virginia: Charlottesville and London, 2000.